I have been using CtrlChanges for some time and find it extremely useful. Being able to track changes without affecting the formatting is great. I find myself silently giving thanks for CtrlChanges' existence. Not only is it wonderful to have the capabilities that CtrlChanges offers, but it's equally wonderful to have those capabilities exist in such an intuitive and easy-to-implement way. 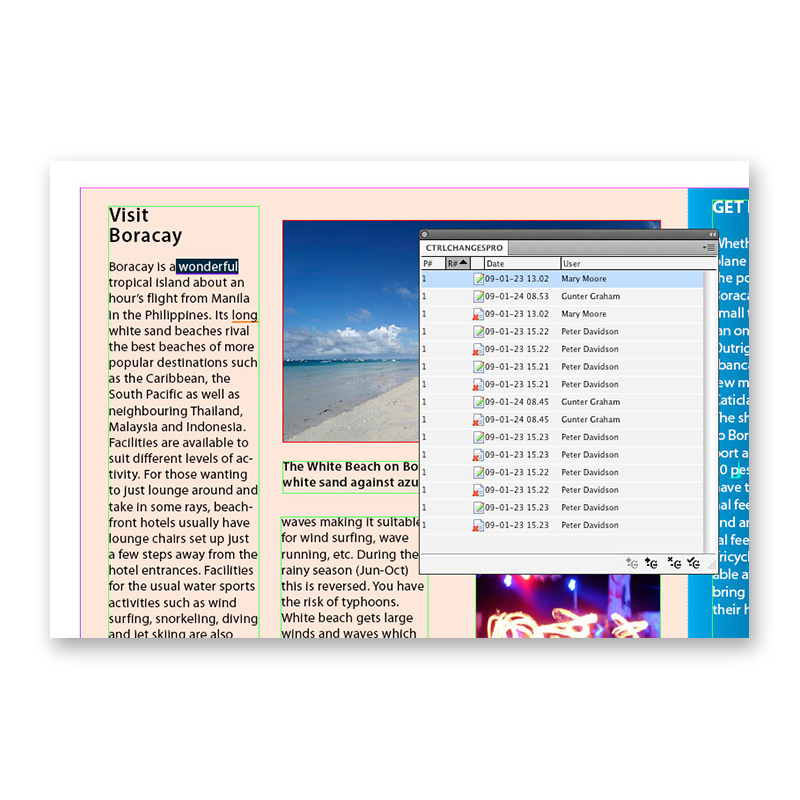 If you require text changes to be tracked in your InDesign files, CtrlChanges gets the job done and is simple to use. Tracking changes in text-heavy documents can be a real pain (not to mention very time consuming). Especially if several people are working with the files. 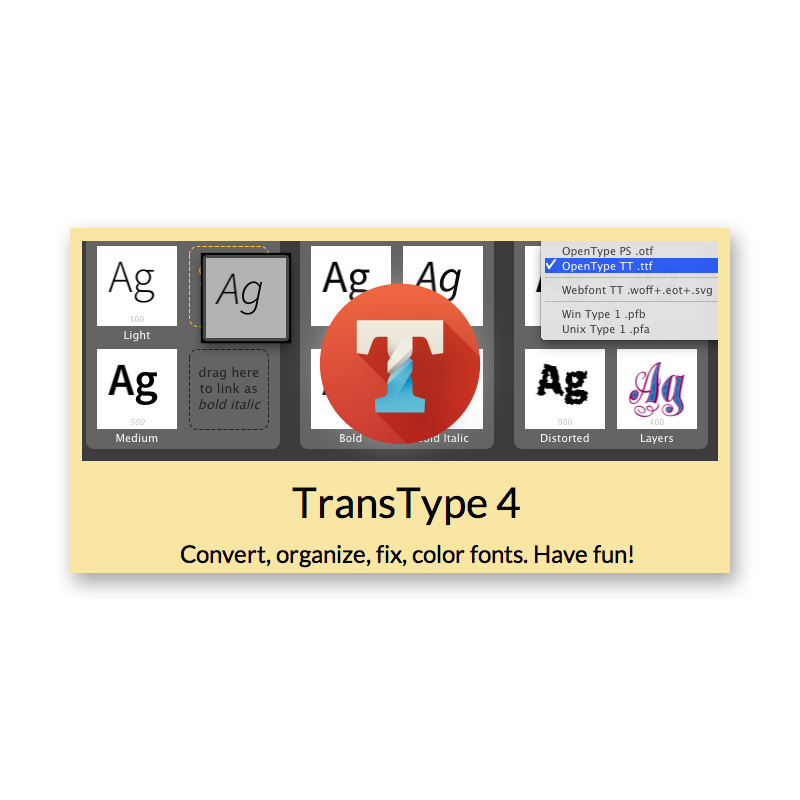 CtrlChanges Plug-in for InCopy/InDesign helps keep your text tracking under control by showing you exactly what’s been modified in your or InCopy/InDesign files. 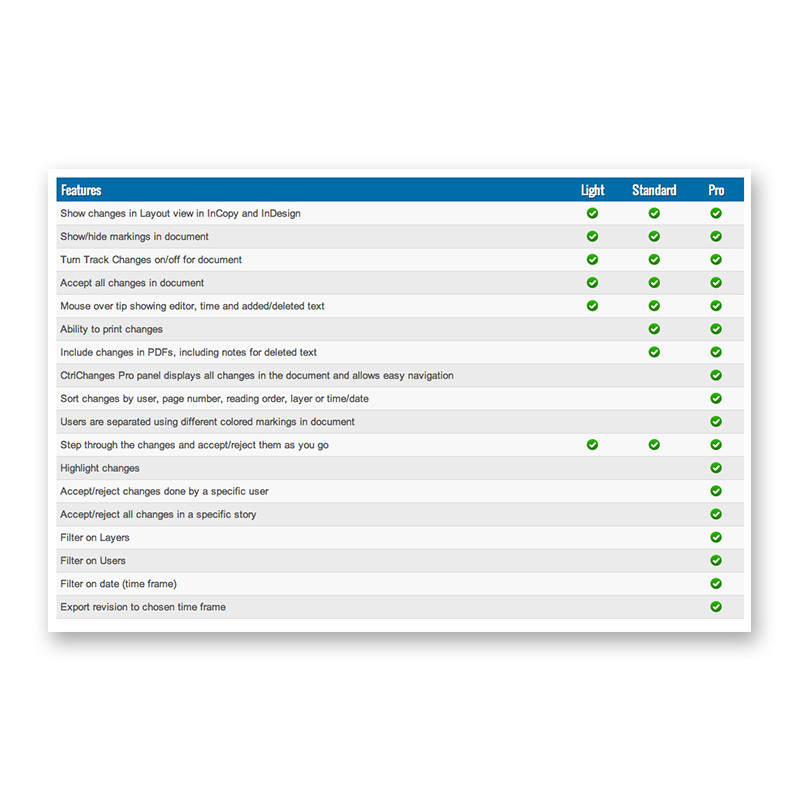 CtrlChanges tracks all text changes, shows added and removed text, tracks who made changes and when, can print a list of changes, builds PDF reports, color-codes text changes based on author and more. 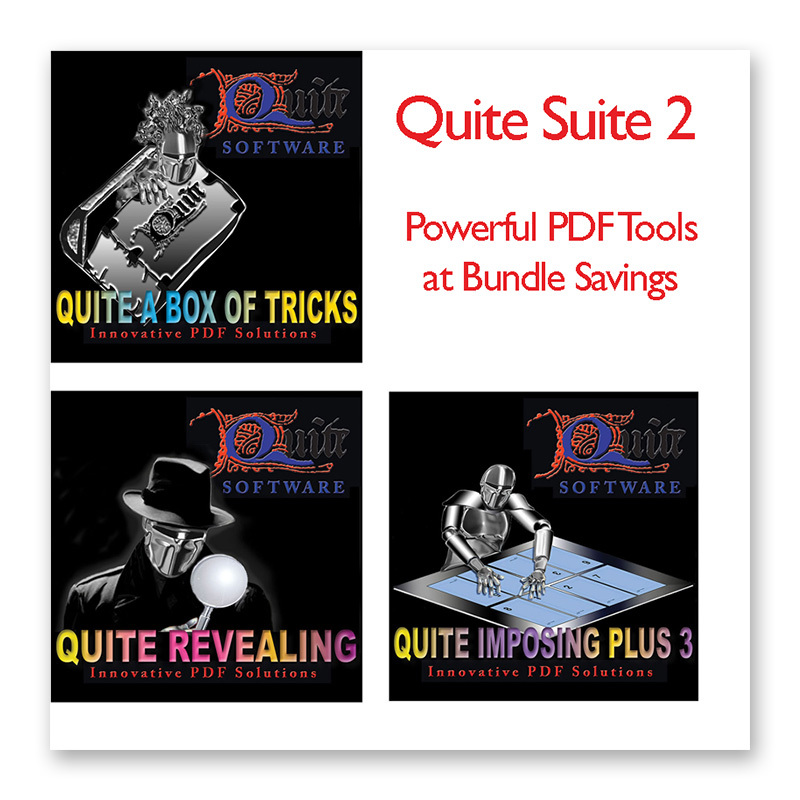 It includes the ability to accept or reject changes, and can build PDF versions of your InDesign documents with changes shown as sticky notes. CtrlChanges is remarkably easy to use, and its features are nicely grouped under a special menu item and also in a tool panel. 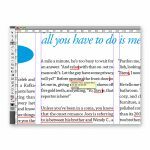 Text change highlighting can be shown or hidden (really useful when lots of people are modifying your document’s copy), and change tracking can be disabled for documents where text control isn’t critical. After you run the installer, you’ll see that a new menu, Ctrl, is available in InDesign’s main menu bar. Open a layout and then choose the Track Changes in Document command from the Ctrl menu to toggle it on. 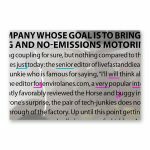 As soon as you enable Track Changes, the Plug-in goes to work, marking up your edits as you change text with the Type tool. If you move text either by dragging and dropping or by cutting and pasting, CrtlChanges will insert its “deleted text” indicator triangle marking the text’s original location (if it was in the same document) and will underline the text in its new location. 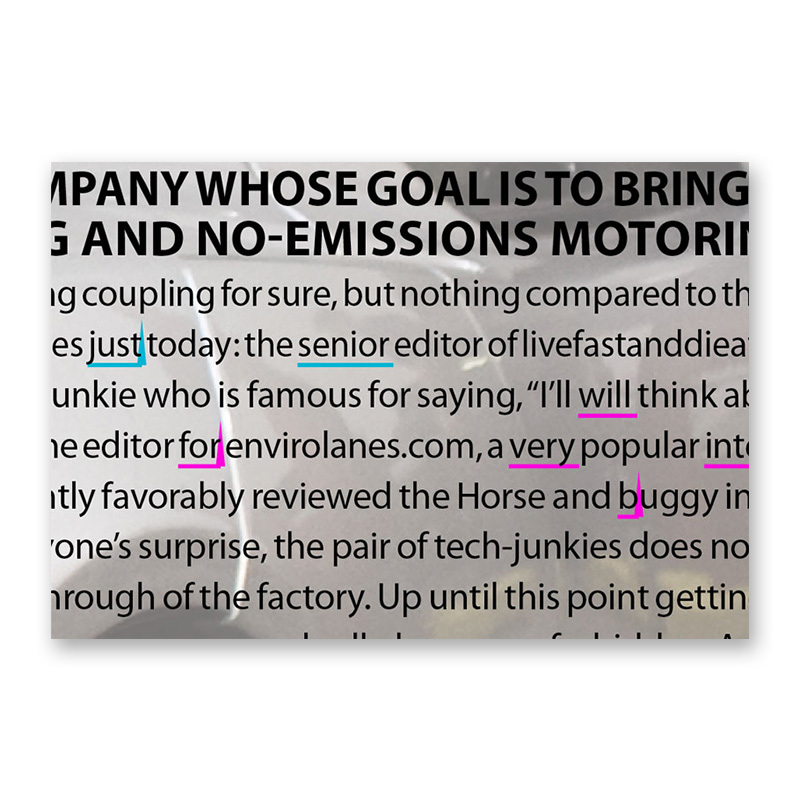 As you edit, you can see the markup appearing in real time, right in layout view (in Normal mode) which to InCopy veterans is a beautiful thing – no need to constantly switch to a text-only editing view to see what’s been changed. The markup is similar to the Show Hidden Characters markup in that it doesn’t affect pagination and it can be shown or hidden from view from the Ctrl menu. 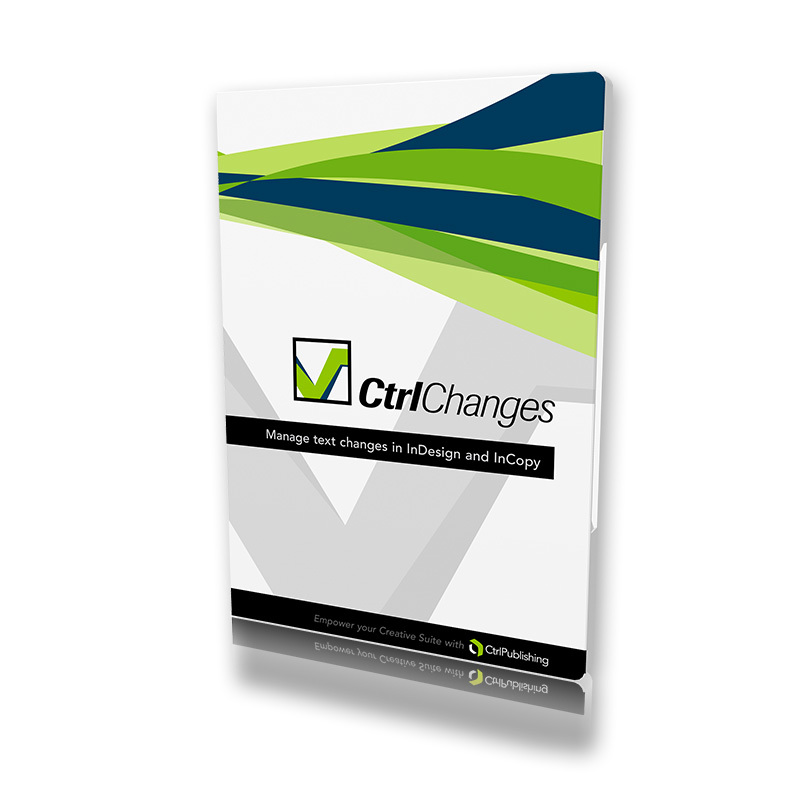 If a user of CtrlChanges enables Track Changes to a document and then saves that document to a template, changes made to the new document will be tracked. 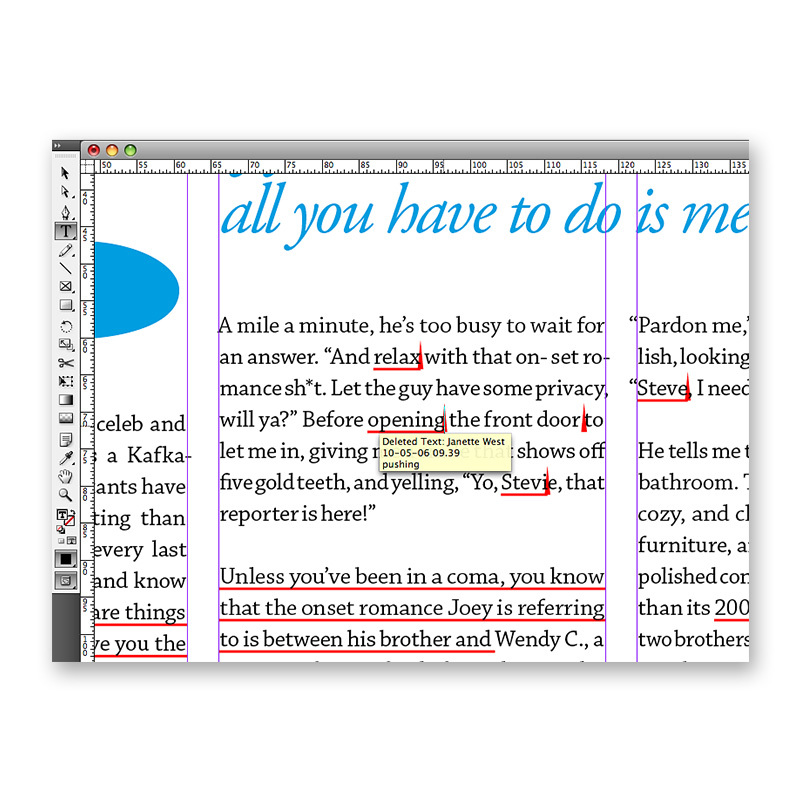 InDesign and InCopy users can hover their mouse over text changes to see who made the modifications, along with a date and time stamp. CtrlChanges Standard has all the features of the Light version, but adds the ability to print changes as well as the ability to include changes in PDFs, including notes for deleted text. 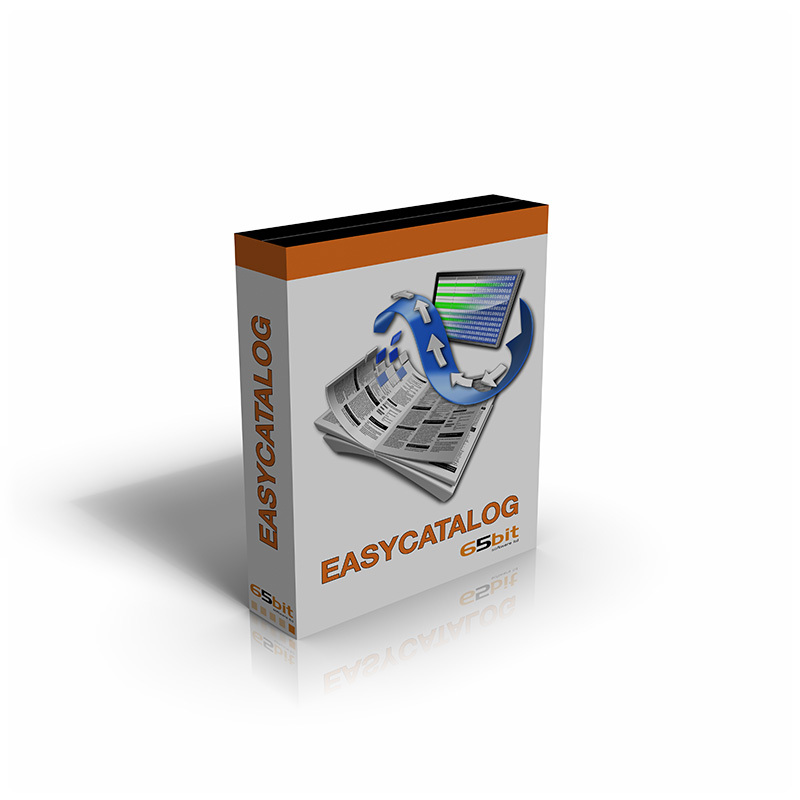 Categories: Manufacturer, Ctrl Print AB, Software Category, Adobe Plug-ins & Extensions, Print, Prepress & Publishing, Editorial Tools, Print, Workflow Tools. Tags: Adobe, Advertising, Approval, Approve, Copywrite, Copywriting, Ctrl, Edit, Editing, Editorial, InCopy, InDesign, Markup, Review, Track, Tracking, Workflow, Writing.